1 photograph: b&w print: 5" x 3"
B&W print depicts the plane Billanca that crashed in Lake Atlin. The pilot was Everett Wasson and he was carrying 3 passengers. This information comes from two other images in this series. There are five images in the series. 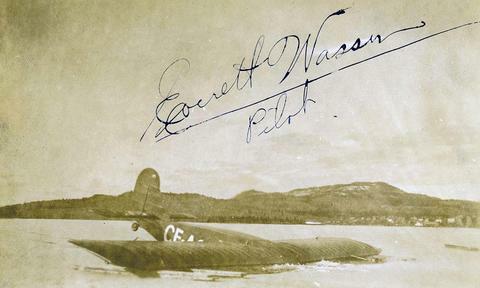 "Everett Wasson Pilot" is written on the front of the image. On the back of the image is written: "Crashed Atlin Lake, 1932/4." Due to the exact date on other photos in this series the date is likely April 29, 1931.